Post Malone, the unlikely and genre-fluid pop-rap star of the moment, has led the Billboard charts for a full six weeks with “rockstar,” his ruthless earworm of a 21 Savage collaboration. Now, the anomalous smash, which has helped catapult Post way beyond the ranks of one-hit wonderdom, has gotten a suitably lavish clip. 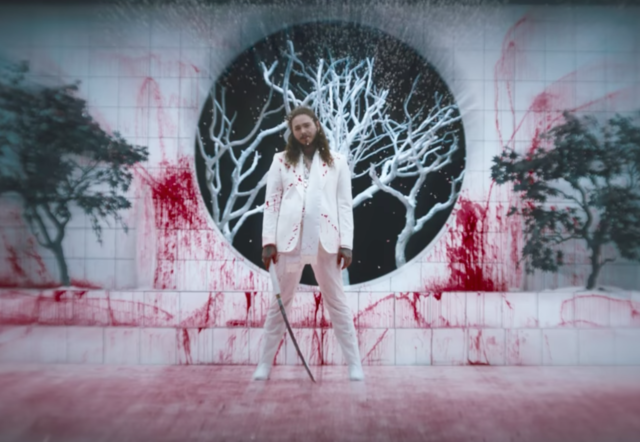 The first thing you need to know about the video is that it’s violent, featuring Post and his posse of white-clad women slaying a gaggle of suits with samurai swords. Buckets worth of blood drench everyone, including a Cheshire-cat-grinning Posty, in a homage to any number of samurai horror films (Pitchfork notes the snow and blood motif in 1973’s Lady Snowblood.) The fact that Post is likely enamored with samurai movies and swords is new information, but the fact that he’s a paranoid gun enthusiast is last week’s news. Watch the “rockstar” video, directed by Emil Nava, below.